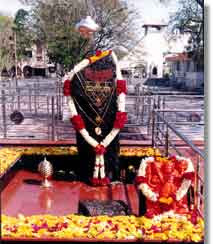 Shani Shingnapur, also known as Sonai, is a village in the Indian state of Maharashtra. Situated in Nevasa taluka in Ahmadnagar district, the village is known for its popular temple of Shani, the Hindu god of the planet (graha) Saturn. Shingnapur is also famous for the fact that no house in the village has doors, only door frames. Despite this, no theft is reported in the village. Villagers never keep their valuables under lock and key. Legend says that the temple is a “jagrut devasthan” (lit. “alive temple”), meaning that the god here is very powerful. They believe that god Shani punishes anyone attempting theft. Devotees, pilgrims and tourists arriving in Sonai can leave their valuables in a car or bus with all the doors unlocked and not worry about anyone stealing it. The only barrier to enter a house are curtains which keep out stray animals. People believe that nobody dares to steal anything because they are punished by Shanishwara, the local deity, and the owner has always got the stolen things back – if any such thing ever happens. The village has a post office and a high school known as Shri Shanishwar Vidya Mandir besides the primary schools run by the Zilla Parishad. The chief source of water supply in the villages is wells. The shrine for Shani compromises of a five and a half feet high black rock installed on an open-air platform, which symbolizes the god Shani. A Trishula (trident) is placed along the side of the image and a Nandi (bull) image is on the south side. In front are the small images of Shiva and Hanuman. Generally, the temple has 30-40,000 visitors a day, which swells to around three lakh (i.e. three hundred thousand) on amavasya (the new moon day), believed to the most auspicious day to appease Lord Shani. The village holds a fair in honor of the deity on this day. A bigger fair on new moon days that fall on Saturdays. Devotees bathe Lord Shani’s image with water and oil and offer flowers. A palanquin procession of Shani is held on the day of the fair. Other festivals include the birthday of Shani, Shani Jayanti. Devotees generally wear a saffron-coloured attire and have a head bath in the holy water close to the temple before entering it. There is no priest to perform the pooja. The pooja is carried out in the form of offering Pradakshinams – of going around the idol a couple of times, chanting specific prayers such as Shani gayathri and slokas. Devotees also perform Abhishekam with water and gingelly oil. 1. The idol is out in the open, as the Lord made it clear in various ways to his devotees, that He did not want to be covered. 2. The temple is open for everyone twenty-four hours. Even at night, men (women are not allowed near the deity) can bring the puja material and perform all prayers by themselves. 3. No house / shop in the village has doors. It’s believed that the deity protects them and if someone tries to steal or do something wrong, they would be paralyzed. Shani Shingnapur is 350km from Mumbai and to reach there it’s best to hire a taxi from Mumbai. Long-distance cabbies from Mumbai take about 7 hours to reach Shani Shingnapur. Although there are MSTC (Maharashtra State Transport Corp) buses from Mumbai to Shirdi (60 km from Shani Shingnapur) and privately-operated buses as well, locals advise not to attempt the bumpy, shaky ride on the MSTC buses, nor the long, frequent-stopping private buses. The nearest airport is Aurangabad (144 Km) which is connected by Indian Airlines and private airlines with other cities/towns. Trains from Mumbai leave for Nasik (123Km) and Manmad (60Km). The village, being a very small one, does not offer any accommodation for the devotees, though there is a Dharmastala nearby where the devotees are fed. Since the village is about 60 km. 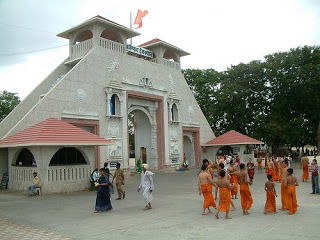 from Shirdi, it is advisable to stay at Shirdi and visit this unique temple.